Responsible investment funds are outperforming their average mainstream counterparts year on year, as the market for responsible investment continues to grow in Australia, the latest Responsible Investment Benchmark Report 2017 has found. 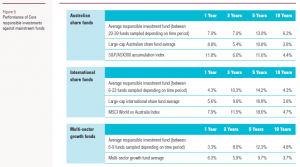 Launched today by the Responsible Investment Association Australasia (RIAA), the report, based on survey results collated by the KPMG Sustainability Services team, shows ‘core’ responsibly invested Australian share funds and balanced multi-sector funds have outperformed their equivalent mainstream funds over three, five and 10-year horizons. Responsible investments have more than quadrupled over the past three years to $622 billion, with nearly half (44 percent) of Australia’s assets under management now being invested through some form of responsible investment strategy – from negative screening, impact investing, sustainability themed funds and the integration of environmental, social and governance (ESG) considerations. A key driver of this growth is that more Australians are wanting their investments and savings to align with their values. The market is recognising the opportunities to create value for clients, with a surge in responsible investment products over the past year, including many focused on delivering positive social or environmental impact. Despite this growth the sector continues to be weighed down by the long out-dated myth that financial returns must be sacrificed to invest responsibly or ethically. The performance figures and trends, identified by the survey directly contradict this belief. 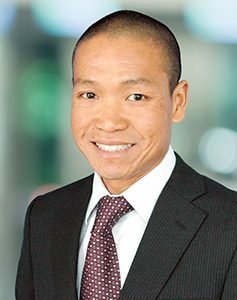 Investments in ‘core’ responsible investments – including positive and negative screening, sustainability themed investments and impact investments – has grown by 26 percent over the past year to $64.9 billion, representing 4.5 percent of total assets under management. ESG integration is the primary ‘broad’ responsible investment approach. 16 managers who manage $557 billion found to be demonstrating a leading approach to incorporating environmental, social and governance considerations into investment analysis and decision-making. The use of screening, both positive and negative, continues as the most popular strategy for ‘core’ responsible investments, growing year on year by 36 percent. Sustainability themed investments grew significantly by 18 percent to $27.2 billion. Transparency of the ESG approaches continue to be an issue for many participants, with ‘lack of understanding of ESG approach by investors’. Survey respondents also identify a lack of qualified advice and expertise around responsible products, identified as key issues in the market. This is further demonstrated by the fact that 75 ‘self-proclaimed’ ESG managers, analysed by the survey, failed to demonstrate an appropriately consistent and transparent approach to ESG and were not included in the report. Survey results indicate that there appears to be a growing awareness/ acceptance of the fact that ESG issues are both a good tool for the identification of investment risk as well as an indicator of investment over performance as well as growing demand from both retail and industry customer. While recent conversations dominating this sector have been predominantly focused on fossil fuel divestment, the report shows significant increased incidence of screens (or filters) based on exposure to nuclear power and human rights risks.